Researchers assessed several years of sediment trap collections near the Deepwater Horizon site, an active natural seep site, and a reference site to understand transport pathways and drivers of sinking particles in deepwater environments (1400 m depth). Sedimentation rates at the three sites were markedly different in composition and quantity, resulting from varied degrees of Mississippi River discharges, seepage material and amounts, and oceanic influences (winds, large eddies, Loop Current). The total flux at all sites consisted mainly of lithogenic material likely from the Mississippi River plume. The area around the spill site showed seasonal flux patterns likely driven by nitrogen from the Mississippi River. The spill and natural seep sites saw higher polycyclic aromatic hydrocarbon fluxes than the reference site, and the seep site experienced a lower flux volume from a different origin than the spill site. Oil was incorporated into sediments through marine snow sinking from the surface or at depth and through feces sinking from organisms that ingested oil. 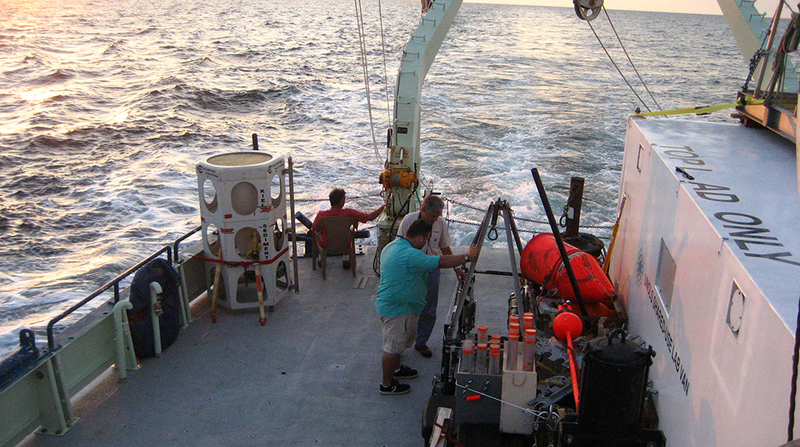 The researchers published their findings in Elementa: Science of the Anthropocene: The ecosystem baseline for particle flux in the Northern Gulf of Mexico. Complex interactions between waters with different nutrient and trophic states and variable currents affect the behavior and composition of marine particle aggregates. Baseline knowledge about how these variations affect particle transport at depth is very limited. The need for a better understanding of these processes became apparent during and after Deepwater Horizon, when an unanticipated and significant transport of oil occurred through sinking marine oil snow. Researchers in this study improved our understanding of particle flux by analyzing samples from year-long-deployed traps (2012 – 2016) for composition, hydrocarbon concentrations, primary production and discharge of nutrients, and seasonal variations. Sediment trap collections reflected seasonal particle production processes from the ocean’s surface. The spill site was the most productive of the three sites, and it experienced a typical winter and summer surface algae bloom driven by Mississippi River nitrogen discharge, which likely clogged the traps during this time period. The magnitude of the September 2010 flux at the spill site was not unusual, but the clear petrocarbon signal in its composition differed from seep and reference sites. There were varied amounts of PAHs depending on location and currents. Sediment trap samples collected after the spill suggest that the higher concentration of PAHs at the spill site compared to the reference site had not recovered to baseline by October 2011. Compared to river influences, open ocean currents and large-scale circulations were the biggest influencers of natural seep and reference sites, which exhibited no clear seasonality, lower sedimentation rates, and different composition (particles from large and diverse sources) than the spill site. The authors suggest that the relationship between flux and particle production at the seep and reference sites is lateral advection; for example, when the currents transport particles from the more productive onshore regions towards the central Gulf of Mexico during the summer. The study’s authors are S.L.C. Giering, B. Yan, J. Sweet, V. Asper, A. Diercks, J.P. Chanton, M. Pitiranggon, and U. Passow. This research was made possible in part by a grant from the Gulf of Mexico Research Initiative (GoMRI) to the Ecosystem Impacts of Oil and Gas Inputs to the Gulf-2 (ECOGIG-2) consortium.